The success of the locally run program not only preserves Rwandan culture and educates foreigners, but brings economic stability and jobs for the communities involved. On the top of a fairly elevated hill, just a few metres from the entrance of Nyungwe Park, there is a collection of small structures. 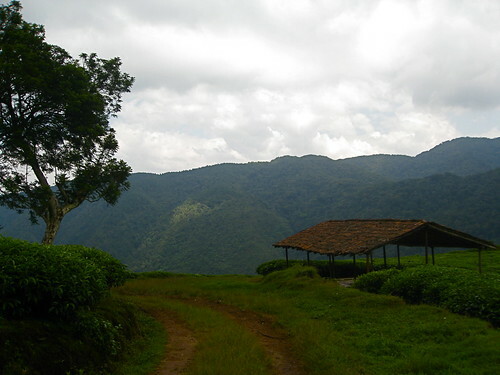 The tourism village is located near the more well-known Nyungwe Park. Photo by Rachel Strohm. On the site, traditional huts built in the royal style, camping tents, a small wooden canteen and a bungalow serve as infrastructure on hand to entertain and accommodate visitors. In what looks like a replication of Rwandan king’s palace life, a man, clad in grey and orange traditional garb bears a crown in his head and is seated in front of the royal hut flanked by a woman acting as the Queen- in traditional attire as well. Two women bow in front of the ‘King’ soliciting and presenting their concerns to the leader while at the gate, two young men armed with arrows man the entrance. Behind the king’s hut, an elderly woman, also clad in traditional attires, sits in a much smaller hut churning milk in the traditional way. The ambiance at the site is cheerful, as tourists are entertained to Rwanda’s traditional songs and dances. The scene is an imitation of life at the king’s palace in ancient Rwanda. The place is named “Kitabi Cultural Village” and was developed by a local cooperative, the Friends of Nyungwe, under the support of the Rwanda Development Board and the US Agency for International Development (USAID). It is a unique destination that promotes community-based tourism by involving local communities in the preservation of Rwanda’s culture and heritage. It offers day trips, king’s hut accommodation, royal ambiance, traditional music and dance, community walk through a tea and banana plantation as well as camping sites. The selection of the site seems to have not come out of nowhere. Seemingly, one reason behind the establishment is its strategic position which provides a wonderful view of Nyungwe National Park and other surrounding hills and villages-giving the visitor a glimpse into the beautiful nature of the neighbourhood. But even, it seems the hill has a historical part in the Rwanda’s history. According to local residents, Ngunda – a mythic hero who is said to have ‘dug’ the thousands hills of Rwanda – spent a night at the hill. But the most reliable story relates to the 1958 events when King Kigeli V Ndahindurwa, the last King of Rwanda, left his Palace in Nyanza and temporarily relocated to Kitabi. “During his stay, he used to come to this hill to observe the beautiful nature of his country,” explains Jean Baptiste Bazambanza, the coordinator of Kitabi Cultural Village. “The hill’s history played an important part in its selection to host the cultural village,” he adds. Almost five months after the village opened to visitors, the number of people who visit it has constantly increased, according to Bazambanza. “Many come from abroad,”- he says. “Earlier, people only used to come with the aim of visiting Nyungwe Park and its various attractions. But today, the situation is changing and many tourists, on their way to the park, stop and come here to witness the richness of Rwanda’s culture. And, as the number of tourists increase, revenues go up as well making a change in the living conditions of the 65 members of the Friends of Nyungwe Cooperative and improving the welfare of the residents who otherwise entirely relied on subsistence farming. “Members are benefiting from the revenues we generate through the activities we showcase in this village,” Banzambanza says. “The project is helping in the socio-economic transformation of the lives of our members”. Vincent Sikubwabo, a member of the cooperative, said the money he gets from the cultural activities helps him solve some basic needs including subscription to the community health insurance scheme and the payment of school fees for his children. “The money helps me a lot,” he affirms. But, for Sikubwabo, money is not the first thing he was yearning for when he joined the cooperative. “I am a zealous lover of culture,” he states. “When I joined this cooperative I wanted to share with others especially those from abroad the beauties of the Rwandan culture”. And, today, Sikubwabo is proud that he is living his dream, while at the same time making money for his survival.